I've been a little light on posting over the last month. I work in higher education (specifically admissions) and it always amazes me just how crazy things get in the spring. Students are excited for spring break. Students are stressed after break for the home stretch for the end of the semester. In admissions we are doing everything we can to drive home the numbers as we near registration and enrollment. We are planning end of the year celebrations. We are welcoming crazy amounts of people to campus for every activity you can imagine. SO... excuses, excuses... I've continue doing projects and haven't made time to post so I've decided to put myself of a 7 day challenge to post a new idea every day for 7 days. Maybe this is old news to some people but this blew my mind! I love bacon (if you eat meat and you don't love bacon, you don't love puppies. It's a no brainer.) but the trouble with it is that you have to watch it like a hawk to make sure it's done right. If it actually worked, what an amazing concept. Preheat your oven to 400 degrees. Cover a large baking sheet with a layer of tin foil (to make for easy clean up). 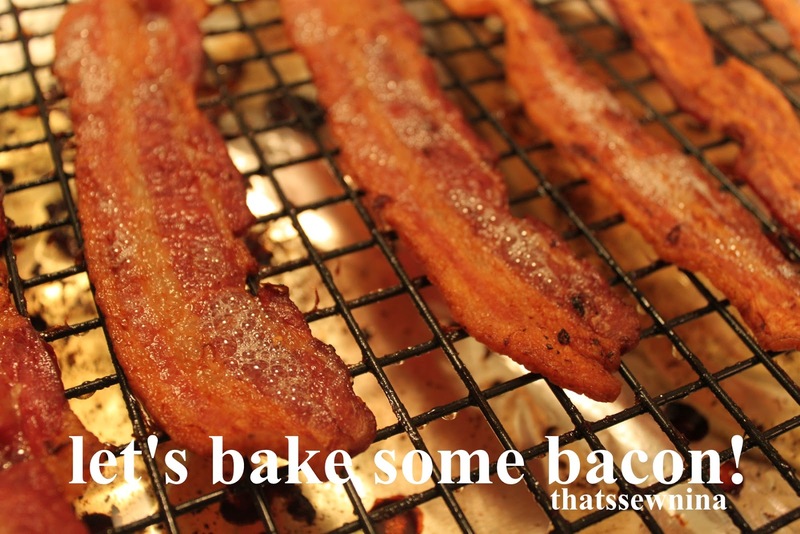 Lay your bacon across a cooling rack to allow air to circulate all the way around. Place the cooling rack over your baking sheet and toss it in the oven. Depending on the thickness of your bacon and how crispy you like it (me? almost burnt to a crisp! ), bake it for 20-40 minutes. We use thick cut bacon from the butcher (is there any other kind?) so I checked it at 20 minutes, then at 30, then finally thought it was done to my liking around 40 minutes. I know that is a long time to wait but I got the rest of breakfast made and my kitchen cleaned up in the meantime. Perfection! The bacon was crisp and flat.